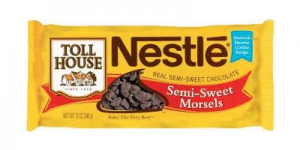 Nestle Toll House; a brand name that is well identified with Americans for chocolate chips since its introduction to the market. Toll House is manufactured by Nestle and is among the highest quality chocolate chips used for baking. The brand has been on a rising trend to market dominance since its introduction in 1939 and continues to gain loyal customers all round the world. Nestle has identified that the true success of a product would be to produce the highest and best of qualities and to craft the brand into something unique. Through identifying this, Nestle Toll House has managed to reach out to more than 60 million customers per annum. Simply put; there are no other baking brands in the market that are as trusted by families for delivering quality and fresh baking as Nestle Toll House is. Toll House can be associated with a number of products widely available on the market. The most famous would be the Toll House Semi-Sweet chocolate chips morsels and the creation of the well-known chocolate chip cookie. Chocolate Chip Cookie Dough, available packages of 24 squares or in a tub that are ready bake. It is a good instance of refrigerated cookie dough offered under the brand name Toll House. Another popular product is Nestle Toll House Baking Dark Chocolate Bar. These bittersweet chunks of eight chocolate bars are easy to melt and make a perfect option for pies, cakes of baking. This is simply what an American family needs in their kitchen for a fun and yummy baking experience.